In Christopher's Gifts, Whisper to Me, and Happy New Year, Baby, three authors share their romantic visions of what can happen when two people who are meant for each other fall in love during the holidays. Original. Pinnacle's Arabesque line continues its annual holiday tradition with this diverse trio of contemporary African American romances, each highlighting a different winter celebration. In Gwynne Forster's "Christopher's Gifts," an upscale interior decorator finds happiness with the man she has hired to be her chauffeur; in Carmen Green's appealing "Whisper to Me," a lovely teacher introduces the rich traditions of Kwanzaa to a widower and his seven-year-old twin girls; and in Lynn Emery's compelling "To Begin Again," a determined social worker activist finds that love does not follow party lines. Although the stories are not equally well done, they make for pleasant holiday reading. "Silver Bells" combine three novellas of a warm and loving combination of the holiday season, Christmas, Kwanzaa, and New Years. In "Christopher's Gifts," Ms. Forster combined three spirits together -- a child's view with that of a businesswoman and a father. Sometimes it takes a child's wisdom to shed light on a situation. In this case, Christopher, aka Chris, is a child who is confused by his view of his father, Wade. The confusion comes about through what Chris has seen or heard all his life from his mother and Wade's ex-wife. However, it is through Chris that other lives are changed. When Chris comes to live with his father, who Chris refers to as "Wade", Chris also meets the woman Wade is "working" for, Nadine Carpenter. A relationship develops between Wade and Nadine. However, Nadine has a secret and so does Wade. Through Chris, the secrets are unfolded. Nadine's secret is something she has been hiding for years, although no fault of her own. She feels self conscious and wants to hide behind her cloak of hair. To Nadine, Wade appears to be more than meets the eye. Wade is on a mission to gain something that is more precious to him than his life, the love and respect of his son, Chris. Wade would do anything to make this happen, even if it means stepping down in life, staying put, and being around when needed. Wade also has another objective after meeting Nadine, a woman who has also changed his life. However, Chris is in for some surprises also. Chris has a secret too. One that once he faces, he in turn, is able to help Nadine overcome a similar situation. Also, a young child, Chris not only learns about life and its values, but he also learns what it is to love someone and have that love returned. In "Christopher's Gifts" love and happiness await Chris, Nadine, and Wade. Truly, the gifts shared with the trio, were priceless gifts. Great story of love, hope, and happiness. Iman Parrish and Cedric Hamilton heat up Carmen Green's story, "Whisper To Me" during the Kwanzaa celebration. Iman and Cedric are a great couple. 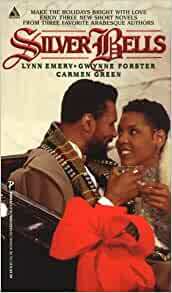 Iman teaches not only about Kwanzaa, but she teaches Cedric a lesson in love and life. Cedric is a man, who in the past had to face hard times, so he is wary of his future and strives to gain all he could. He wants to make the best for his daughters and ensure that they are never without. Cedric is a little overanxious where money is concerned, but it takes Iman to show him that money does not always mean happiness and there is more to life than money. Love can also mean happiness and security. Iman turns Cedric's life around with just the soft whisper of words, until he says, "Whisper To Me." "Happy New Year, Baby" was great. It covered the political and social issues involving a city that brought Shani Moore and Eric Aucoin together not only in the public, but also in their private lives. Shani and Eric had to deal with events that left their personal lives upturned. Could their new found love withstand the obstacles they were faced with involving community action or would their love slowly dissolve as the old year goes out and the New Year comes in with a bang? "Happy New Year, Baby" was a wonderful story. Loved it, Ms. Emery.